The euro vs dollar ended the week with an indecisive day on Friday, ending the trading session as an up bar, but with shadows to both the top and bottom of the body. However, whilst the candle itself was relatively ordinary, there are several clues technically that suggest that we may see the euro vs dollar push higher in the early part of the trading week. First the low of the trading session bounced off an identical price level as for Thursday, which also aligns with the low of the hammer candle on Monday, suggesting that there is some sustained support in this region. 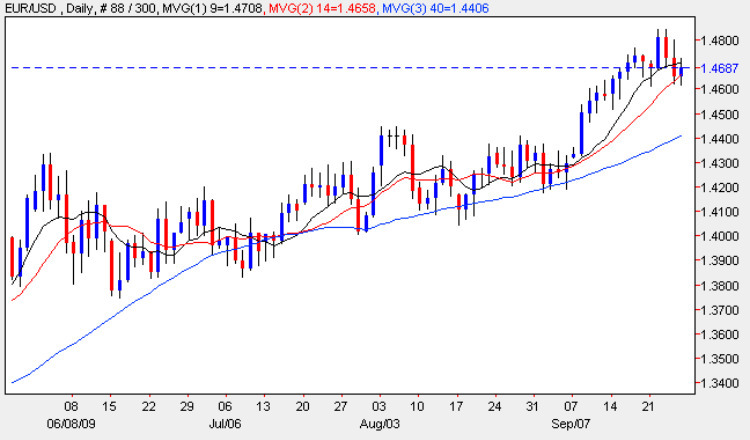 Secondly the low of the day found support from the 14 day moving average once again, as for Thursday, suggesting that the reversal lower was only a short term reaction to the FOMC meeting, and that this fundamental news has since been absorbed by the markets which are now set to move higher once again, as the US dollar continues its long slow decline lower once again. Should this be the case then we should see a break and hold above the 1.4800 price level in the short term, with a push towards the 1.500 price handle and beyond in due course in the medium term. Monday is once again a very quiet day for fundamental news on the economic calendar, with only the Preliminary German CPI data due for release, and due to the way the data is reported from each of the various states, then this is drip fed to the currency markets throughout the day as each region reports. The forecast is for a figure of -0.2% which if correct is the same as for last time. The only other item of news for the euro vs dollar is a speech by ECB President Jean Claude Trichet due in the afternoon, and with nothing to report in the US, we should see a relatively quiet day for the euro vs dollar pair, with Tuesday being a much busier day.